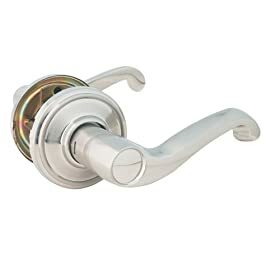 The builder has polished chrome for door knobs and they are just ... too shiny for our taste, so we set out to have them changed; and the cost is around $900 for changing to a different finish! Yeah right, we said. Dummy, typical for closets. Qty. 10. Est. $15 each, $150 total. Passage (no latch), typical for kid bedrooms and library, pantry. Qty. 8. Est. $20 each, $160 total. Expect to pay at minimum, around $580.